Custom golf clubs can help you gain distance and accuracy. No two golfers are the same, and it follows that using a golf club that fits your physical characteristics and playing abilities may improve your distance, accuracy and consistency on the golf course. High handicappers stand to gain the most benefit from custom clubs, because they have so much room for improvement. Custom right- and left-handed clubs are available for men, women and juniors. To buy custom golf clubs that fit you well, you must be fitted properly. You can go to a golf shop to get measured, or use an online service to take your measurements for height, arm length, and hand size. In addition, you need your wrist-to-floor measurement determined by allowing your arms to hang comfortably at your side while wearing street shoes and standing on a hard surface. Take the measurement of the distance from your wrist to the floor. 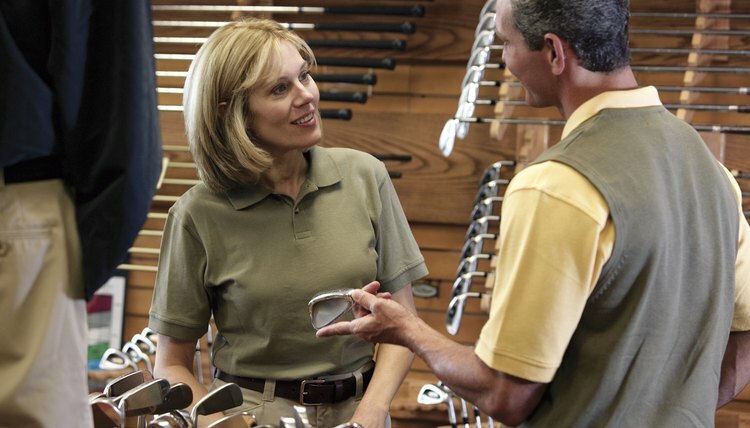 Have your golf professional can assess your swing speed, or try a local sporting goods or golf shop to have it done. For the high handicapper, offset clubs are a good option. Offset clubs help golfers close the clubface before hitting the ball. In a progressive offset set of irons, the offset becomes smaller with the high number irons, such as the 7, 8 and 9 iron. Those clubs are normally easy to hit without an offset. For the mid to high handicap golfer, a low center of gravity is recommended. This allows the typical golfer to achieve loft more easily, while providing forgiveness for miss hits. Low handicappers can handle the less forgiving traditional blade or “muscleback” irons with a high center of gravity. A golfer will achieve good distance on his driver when the loft is coordinated to the swing speed. The golfer who has a lower swing speed needs a greater loft to get the best trajectory for maximum distance. “Standard” lofts for each club can vary a bit, depending on the manufacturer. Keep in mind that the less loft a club has, the harder it is to hit. Consult a chart to find out how you measure up to the standard shaft length. You can do this by using a chart with your height and wrist-to-floor measurement. For example, if you are 6-feet tall with a wrist-to-floor measurement of 35 inches, you will take the standard length shaft. However, if you are 6-feet tall with a wrist-to-floor measurement of 37 inches, you need to add .5 inches to the standard length when purchasing a custom club. Consult a chart that determine the standard lengths of each club and add or subtract the predetermined length. Keep in mind that the longer the club, the harder it is to hit. Players with a slower tempo golf swing should use a more flexible shaft to achieve more distance, while golfers with a faster, harder swing can go to a stiffer shaft that helps with accuracy problems. Use a chart with your glove size to determine the size of the grip.